The last week of February witnessed a United Nations donors conference for Yemen. Since a Saudi-led coalition began carrying out airstrikes against the Houthi rebels four years ago, children have been killed , homes have been destroyed, and about 80 percent of the Yemeni population has been left in need of humanitarian aid and protection. 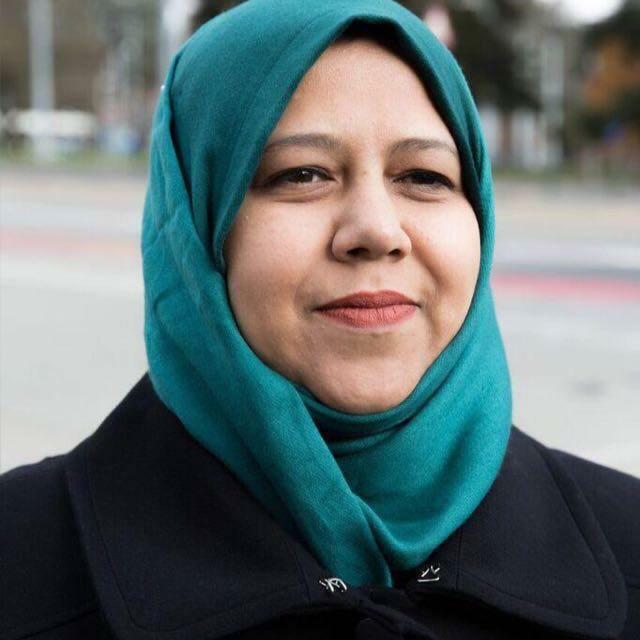 ICAN’s Aya Nader talked to Yemeni peace activist and co-founder of the Women Solidarity Network, and member of the Women’s Alliance for Security Leadership (WASL), Muna Luqman, about the war, its devastating ramifications, and about the strength of Yemeni women in the face of this destruction. A war erupted in your country in 2014. To those who have no knowledge about it, could you explain what is going on? The conflict in Yemen deepened an already serious humanitarian crisis in a country which, before the conflict began, was already the poorest in the Arab world due to corruption and civil unrest. In 2014 the Houthi rebels pulled out of transition talks in the National Dialogue that aimed at creating a new and stable Yemeni government after former President Ali Abdullah Saleh’s downfall during the Arab Spring. The National Dialogue supported active participation of non-political stakeholder groups such as the civil society, youth, researchers and academics as well as women. In fact, women were accorded a 30 percent quota within all delegations to the ND; a separate women’s delegation (making up 7 percent of the ND’s membership); and a 30 per cent quota on the ND committees. The rebels allied with their former enemy Saleh, seizing the capital Sana’a, and overthrew the new president, Abd Rabbu Mansour Hadi. They invaded through Sana’a and caused corruption and instability in the country. Ever since, the people of Yemen have suffered deteriorating and horrific conditions. After they seized Sana’a in 2015, forcing Hadi to flee, the exiled Yemeni government asked its allies in Saudi Arabia and United Arab Emirates to launch a military campaign to drive out the Houthis. The UN Security Council members supported the intervention. It dramatically escalated the conflict. They are bombing the populated cities and infrastructure. The result of the war and the catastrophe threaten the lives of millions of Yemenis. The warring parties of this conflict have restricted humanitarian assistance and carried out frequent attacks on civilians and infrastructure. Starvation has been used as a tool of war, specifically in the Houthi militia-controlled areas where most of the UN agencies are working. Civilians are trapped in the middle – more than 15,000 of them have been killed and injured and a humanitarian crisis has spiraled. In 2019, many governments pledged millions of dollars in aid to Yemen, which has been described as having the worst humanitarian crisis in the world. Does this aid help? The country is torn with war and battles in various cities and villages. Conflicts are tearing the country apart. Millions have lost their livelihoods, amid complete or partial interruption of civil servants’ salaries and suspension of the social welfare aid transfers to vulnerable groups. The collapse of the health system has led to catastrophic consequences, including outbreak of diseases, such as cholera reaching more than a million of suspected cases, and where women accounted for 50% of those affected. As important as the financial contributions to the Yemeni pledge, it is more important that the international community exerts pressure on the warring parties to come together to put an end to this senseless war and overcome the mass starvation. These are horrific circumstances, where we are helplessly watching our own children die in front of our eyes either because of the lack of medical supplies or severity of the malnutrition cases, or seeing them be recruited by the militias as child soldiers or losing a limb in a landmine explosion planted by vicious rebels or in an airstrike. There must be an end to the naval and aerial blockades.by Saudi. They must open commercial aviation routes, including at Sana’a airport. The rebels also must be pressured to give access to humanitarian aid and stop harassing volunteers and humanitarians. Investing in women should also be prioritized as it brings significant benefits. Local women’s groups are a key means of accessing remote areas and understanding the local context. They are doing so much peacebuilding and relief work but despite their contribution to peace and combating violent extremism, and resilience-building strategies their work remains undervalued and under-resourced. As important as the financial contributions to the Yemeni pledge, it is more important that the international community exerts pressure on the warring parties to come together to put an end to this senseless war and overcome the mass starvation. You say women are building peace, can you explain what they are doing and how Yemeni women are fighting back under this conflict? Yemeni women are truly the everyday heroes. Since the war broke out in Yemen in 2015, and despite security challenges, displacement and increasing multifaceted patterns of violence inflicted upon them, Yemeni women have devised new kinds of communal and inclusive resistance to tyranny and militarised environments. Women in Yemen have an increased responsibility during the conflict to maintain the social fabric of the society and keep families and communities together. Women have also taken on roles as peacemakers and mediators. I was directly involved in mediating of many local conflicts that aroused during the civil unrest before the break of war and during the war such as mediating to evacuate children trapped in crossfire and resolving an armed water dispute and mediating also to open humanitarian corridors in the city of Taiz and facilitating the entering of oxygen and medical supplies and other humanitarian aid at a time when there was no presence of government services or international organizations on the ground. Meanwhile, women peacebuilders in Yemen are tackling many core problems. Because of the armed conflict gender based violence increased by 70%, thousands of women have been killed and injured, and the number of internally displaced persons has now reached more than three million, 76% of whom are women and children. Child marriage has also increased to 66% as families resort to it as a coping mechanism to address the poverty widening gap and the deprivation of economic opportunities. The war has, in other words, given women more responsibilities but the cultural values and traditional perceptions have not changed. You have spoken on numerous occasions to high ranking officials about women’s participation at all levels of the peace process. How are Yemeni women demanding inclusion at the peace table and why is gender inclusion important for decision-making? The impacts that Yemeni women have made during this conflict are critical contributions to security and will definitely contribute to better and sustainable peace agreements. We, as women, have the highest stake in peace. Members of the Women’s Solidarity Network relentlessly work to end bloody conflicts over water and land resources, to evacuate schools from armed groups, to restore the rights of our sons and daughters to education, and risk our lives on a daily basis to rescue families trapped in conflict zones. Many network members play leading roles in alleviating the suffering of citizens through conducting relief projects and negotiating the opening of humanitarian corridors. 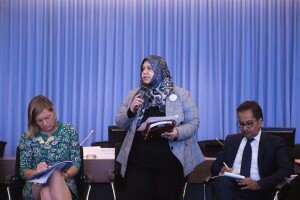 We are advocating around the world to support women’s effective participation in the Yemen talks to ensure that the peace agenda is gender responsive and that women’s agenda for peace and priorities are reflected. We also want to ensure that the delegates and the mediator have gender experts on their teams. We are also demanding that the Yemeni government regularly consults with women leaders and women’s organizations from across the country to ensure women’s representation in peace processes in all tracks, of no less than 30% as per National Dialogue Committee outcomes, including women’s representation in all committees, such as the de-escalation committees, reparation and reconstruction committees, and any other committees formed. What are the main challenges women peacebuilders face in Yemen? Women have been excluded from the current formal peace talks by parties to the conflict, reversing the small gains in women’s political participation made previously. While they have engaged in local level peace initiatives, they lack the resources to maximize the positive impact of their role. Peacebuilders are currently being attacked, detained and accused of being traitors, although the protection of women is a local norm, and women used to rarely be victims of assault or direct targets of violence, because Yemen is rich in social capital. Part of this is due to their work in coexistence, deradicalization and community awareness because these militant groups specifically the Houthi rebels militarize the community and see women as a threat. It is also a weakness at the international level. We have UNSC 1325 from 19 years ago calling for the inclusion of women, but look at UNSC resolution 2216 from 2015, it is gender blind. Women are doing so much peacebuilding and relief work but despite their contribution to peace and combating violent extremism, and resilience-building strategies, their work remains undervalued and under-resourced. You’ve spoken last month to Dutch Minister Sigrid Kaag in Geneva to raise awareness among donors of the importance of mental health and psychosocial support in humanitarian settings. Can you further elaborate on this issue? Yemenis have been affected by this war both physically and mentally. Their coping abilities, including access to basic resources such as food and water, social services, education, and health care have been compromised and threatened. Children’s, coping abilities have been devastatingly disrupted because of the persistent bombings and fighting, their disrupted education and of course the lack of food and health care. Mental health and psychosocial support is a crucial component, especially during the ongoing conflict. However, with a lack of psychiatrists in the country, we are advocating to ensure there is more funding allocated for training and support to access more crisis victims and that gender-sensitive health services, psychological and social support be provided. How did you get into the peace sector? And what keeps you going? I have always believed in equality and synergy between people, my diverse upbringing in the UK and cultural teachings that run in my family has also contributed greatly to my universal vision of unitedness. Additionally, my work with people with special needs and marginalized groups has driven this perspective. I gain my strength from these people especially the children that look up to us in search for peace and I feel a responsibility towards them to make this world a better place. You are a partner of the Peace Track Initiative, which was established to create a space for the contributions of women, youth and civil society organizations to peace processes. How does the project work? Peace Track Initiative is working to bridge the gap between donors and women led CSO’s and initiatives at the grassroots level in the fields of humanitarian access and peace building We are working on access to decision-making spaces and meaningful participation and ensure that women are fairly represented including 50% for southern women, 20% for young women, ensure that representation is addressing the geographical diversity at the local and national levels. As the co-founder of the Women Solidarity Network, can you tell us about your organizations’ advocacy? The Women Solidarity Network is the largest network in Yemen working within the UNSCR 1325 framework. It is a mechanism for women to be heard in the negotiation process, including rural women and women victims/survivors of the war to ensure that their priorities are addressed in any upcoming political solution. Through the Network we work together with Peace Track Initiative to support women peacemakers at the local community level in the urban and rural areas, through allocating necessary resources, supporting them technically, and advocate to ensure that there are mechanisms for protecting women and women human rights defenders. Women in Yemen have an increased responsibility during the conflict to maintain the social fabric of the society and keep families and communities together. Women have also taken on roles as peacemakers and mediators. You are the Chairperson of Food4Humanity. Tell us about this initiative. Food4Humanity has been an initiative which has been one of the first women led CSOs in Yemen. It was formed in 2015 and is a Yemeni Foundation founded by Yemeni women volunteers working on the ground in the areas most affected by the famine, and lack of humanitarian needs. Food4Humanity works in the most remote parts of the country where those who are most vulnerable to conflict and violent extremism live, with special focus on Taiz, Hodeida, and Sanaa. We are working on humanitarian aid in addition to promoting civic values, charitable and responsible citizenship, especially among young people. Food4Humanity contributes in creating opportunities for meaningful small projects, preventing youth violence and enhancing capabilities to increase positive community change. Water4Peace, a project by the initiative, is helping to empower women and youth to bring their communities out of poverty and dispute by providing close, clean water supplies, awareness programs and income generating projects based on availability of funds. You have experience with local NGOs in Yemen, as well as International Organizations, such as the United Nations. How are they different? And how can the gap between them be bridged? There is a huge gap between INGO’s and local initiatives and NGO’s in Yemen, specifically in the field work, distribution of aid and outreach. The local initiatives specifically those led by women – which most of them are, have a proficiency in adapting to changing social environments, organizing to collectively address problems and needs, drawing on traditional knowledge and improvising skills to face difficulties. The insights drawn by their constant work on the ground is valuable. As a partner of WASL, where does the organization weigh in? I have been blessed to join WASL and to learn first-hand from the masters of women, peace and security, the real divas led by the great Sanam Naraghi-Anderlini. WASL is a network with a sincere voice saying to our hearts: “Continue your great work “We are here for you” “You are not alone”. The message is consistent and empowering, enabling strategic collaboration between women peacebuilders around the world. We share success stories from strong and wise women and men community leaders and peace makers working at the grass-roots level during violent conflict and how their crucial role has been vital in preserving social order and fostering a culture of peace in their communities. We learn practical methods and technical strategies to continue our work in a more constructive and efficient perspective to maximize results. Together we stand in solidarity and we stand strong. I gain my strength from the people especially the children that look up to us in search for peace. How do you see the way out of the current situation in Yemen? We also need to focus on state-building, specifically revisiting the National Dialogue Committee model of inclusion to reduce tension and prevent more conflict. The people of Yemen have had enough fighting and despair. They have lost everything to this conflict. In the end the warlords are getting richer and more powerful, and the people are left to cope with the consequences. We have to stop this cycle and this is why we, as women peacebuilders will persist in being present, in ‘popping up’ everywhere, because we can’t and we won’t let them continue this war.